Hitman is the fantastic slot from Microgaming that’s all killer and no filler. 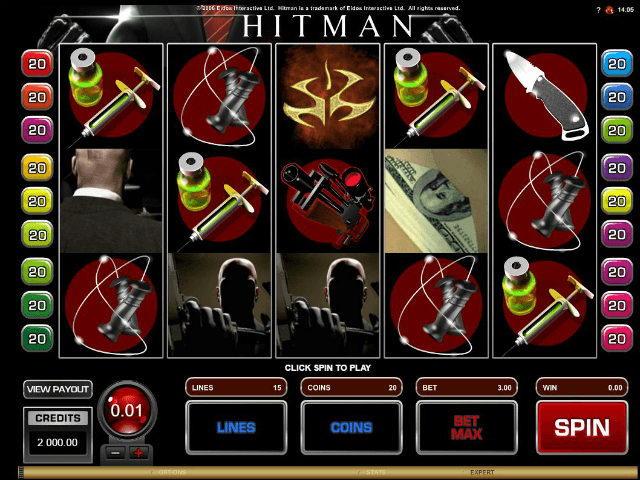 The online video slot brings the lead character – the mysterious Agent 47 – to the reels. Get your trigger finger ready and hope you’re on target for a whopping jackpot of 270,000 coins. Hitman is the fantastic slot from Microgaming that’s all killer and no filler. It’s the online video slot brings the lead character – the mysterious Agent 47 – to the reels. Get your trigger finger ready and hope you’re on target for a whopping jackpot of no less than 270,000 coins. The five reel, 15 payline slot manages to recreate some of the most memorable features of the cult game, from the foreboding orchestral soundtrack to the assignment instructions of your ICA handler, Diana Burnwood. You’ll be treated to video clips with each big payout, and even the colour scheme reflects the titular assassin’s uniform of choice: a black suit, white shirt, and blood-red tie. Players can choose themselves how many lines they want to play with and how many coins to bet on each line (1 to 20). Coin values vary from 0.01 to 0.50, which means you can join the action from a minimum bet of 0.01 and a maximum of 150.00. With that said, this killer slot is suitable for players with all sorts of budgets. To make things a little easier, players can also make use of the Auto Play button. You can spin automatically up to 500 times using your chosen bet. To manage your budget, it’s also possible to set a win limit. Auto play will stop if this limit has been reached or exceeded. 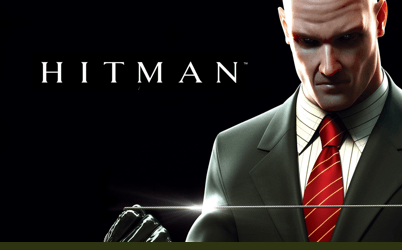 The game’s symbols are all in keeping with the title theme, featuring Agent 47 himself and the tools of his trade – a sniper rifle, knife, garrote wire, lethal injection and his signature Silverballer pistols. The character in the iconic pose, holding two guns to his chest, acts as an expanding Wild symbol. This means that it will turn a whole reel Wild if it lands on reels two, three or four, and will substitute for any symbol except the Scatter and Bonus symbols to complete a potential payline. The Scatter symbol is an 18 certificate symbol. If this symbol appears on reels three, four or five, then 18 free spins will be granted, during which any win is doubled. Bonus features and expanding Wilds can occur during the Free Spins Bonus, but free spins cannot be re-triggered. The bonus features include the Insignia Bonus and the Contract Bonus. The Insignia Bonus is triggered when a player lands the Insignia symbol on reels one, two and three. You’ll need to select one of the symbols to reveal a hidden multiplier bonus. The Contract Bonus is activated when the computer symbol lands on the last three reels simultaneously. You'll get to choose one of five targets to eliminate along with your weapon of choice. Your chosen target and weapon both carry mystery values that are multiplied together for a deadly win up to 270,000 coins. With so many rewarding bonuses and extras, you don’t have to be a fan of Hitman in order to enjoy this fantastic slot!